Aluminum or Steel Truck Racks? Aluminum or Steel Truck Racks: Which Is Better? A truck rack is a vertical metal frame that’s mounted directly behind the cab of the truck. Traditionally, its primary purpose was to prevent heavy or sharp items in the bed of the truck from going through the cab’s rear window. Truck racks, also referred to as headache racks, have evolved over time to serve a variety of different functions. 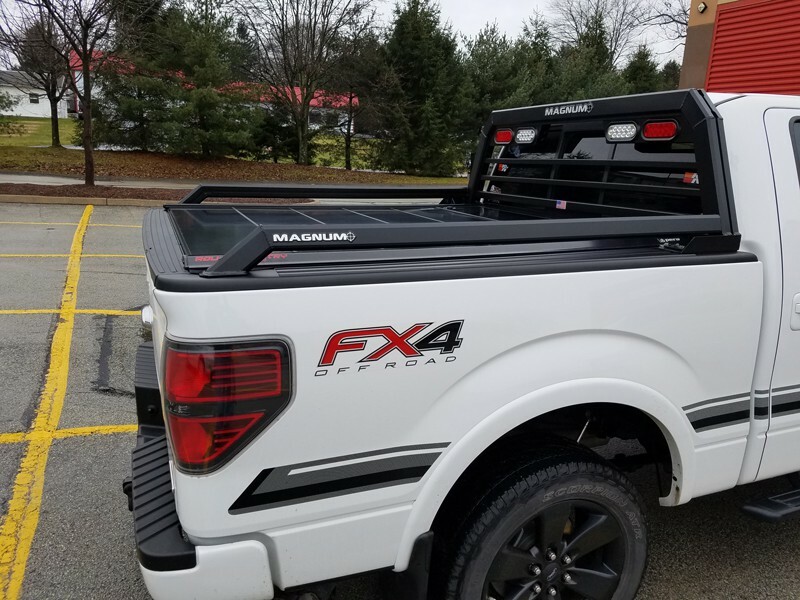 In addition to being functional, racks are also installed by truck owners to give their vehicle a stand-out, striking look. 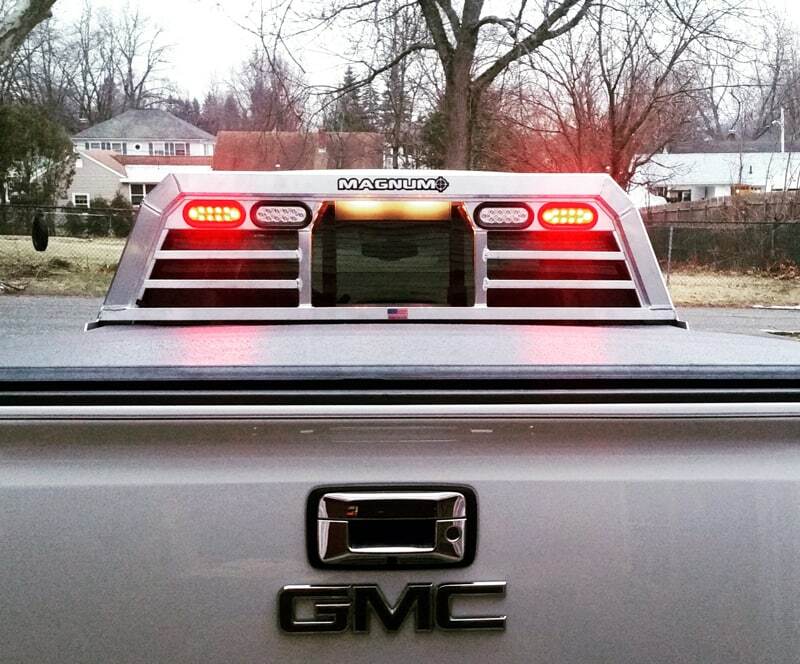 Many truck racks now include optional eye-catching lights and a sleek design. Truck racks have traditionally been made from steel, although aluminum racks are now gaining in popularity. Some truck racks also contain both aluminum and steel parts. To determine the best choice of material for a truck rack depends on factors such as the rack’s required strength and the environment. So, which should you choose: an aluminum or steel truck rack? When comparing the properties of steel and aluminum racks, it’s important to remember that aluminum racks are made of aluminum alloys rather than pure aluminum. Although steel is sometimes stronger and more durable than pure aluminum, aluminum alloys are actually stronger than some common steel alloys. Aluminum also weighs significantly less than steel does, which allows a manufacturer to make the metal thicker (i.e. “gauge” it) in certain areas of a product, without adding an unnecessary amount of weight. A rack should be able to withstand the sudden impact of items from inside the truck that could strike it during heavy braking such as clamps, hammers and wrenches. 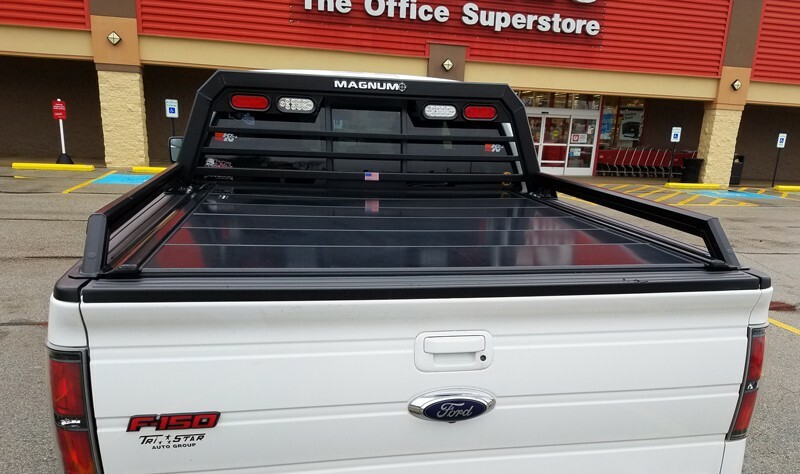 A truck rack may also need to protect the cab window from much heavier cargo in the truck bed. Racks may also be used to hang items, requiring the rack to support a constant load. In the case of pickup trucks, these items may be relatively light such as emergency lights or rear-facing cargo lights. The racks for semi-trucks are more likely to be used for heavier items such as tire chains. Historically, steel truck racks have been generally less expensive than aluminum racks of the same strength. However, over time aluminum racks have become equally as competitive in price and are no longer sold at a premium in comparison to steel. Generally, steel racks are constructed by welding various pieces together. One advantage of steel is its magnetism. This property allows you to attached magnetized items by simply placing them against a steel truck rack. In general, however, there simply aren’t as many benefits to manufacturing truck products from steel anymore. Steel is corrosive and will determinate over time, whereas aluminum is a longer-lasting product. Steel also rusts, which gives an unsightly appearance. Before welding can be done on steel, all old paint must be chipped and removed first, which can be very labor intensive. Aluminum’s light weight is one of its primary advantages over steel. Aluminum has about one-third the density of steel, as outlined above in the Forbes.com article. The net result of these differences is that an aluminum rack will typically weigh 10 to 15 percent less than a similar steel rack. This weight difference can be significant for large racks, especially in the case of commercial trucks where cargo capacity is important. Aluminum racks don’t rust because aluminum alloys do not contain iron, which is the primary component in steel. Truck racks made from steel must use additional methods to protect them from rust. Stainless steel resists rust well, but it’s also more expensive than regular steel and not as strong. Steel truck racks can also be galvanized, which involves coating them with zinc. This process prevents the steel from rusting, but it also adds to the cost of the rack. In addition, galvanized steel requires preventative maintenance to keep the zinc layer from wearing off over time. Overall, an aluminum truck rack will keep a polished, new appearance far longer than a steel rack. In 2017, aluminum racks are the clear winner when compared to steel. An aluminum truck rack is comparable in price to a steel rack but it is significantly lighter weight. This allows a manufacturer to manipulate specific areas of the rack to provide more strength through “gauging.” Aluminum racks are also much more polished, due to the fact that they do not rust like steel racks.